We left our Gîte Aux Bonnes Etoiles in Castres around 7:45am to the sound of church bells ringing and me wheezing. By 7:45am we were in a patisserie stocking up. 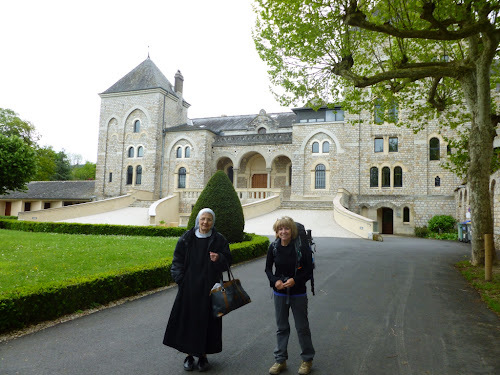 It was a fairly easy and short 23 kms to the Abbaye and our Gîte du Gazel in Dourgne. The biggest challenge was the mud. We did pass our first group of pilgrims that we had seen in almost a week, a group of five French people on their ten day holiday walking from Castres to Auch. We are doing that also just taking longer. They emphasized one of my pet peeves as they hurried on past us...they had been taking a smoke break. Shouldn't they be the one's gasping for breath and lagging behind? The Abbaye Sainte-Scolastique is a massive convent, almost modern in appearance as it wasn't built until 1890. Sœur Jean-Marie from the Abbaye took us across the road from the Abbaye to the Gîte de Gazel and showed us our room. We dumped our stuff and walked down the road and up the mount to the village of Dourgne, confident that we would be in perfect time for stores, restaurants and bars. Nope, not in Dourgne. Where everywhere else we went to closed up shop at 2:30pm, this town didn't open until threeish. We did manage to find a place to have a limonade and a glass of rosé. Deciding that there was nothing we needed enough to wait an hour to purchase,we went back to the gîte to nap until dinner. The Abbaye Sainte-Scolastique offers a place of silent refuge for whomever needs it. It is a retreat from the hurried pace and chaos of the modern world, from worries and woes, or from just too much to do. It is a kind of spa for the soul. So our eighteen dining companions that evening were a varied lot. Only three of us were pilgrims, three were walking holidayers and there were also two young people, eighteen years old, who were spending ten days here to study and prepare for an entrance exam for a specific university International Political Science program. What better place for quiet study than a convent, and it comes with a place to sleep and meals! Many of our multi-tasking youngsters study with their iPods, their books, their Facebook accounts open and active and maybe watching TV at the same time. I wonder how they would handle a week of no social media and of silence. The other pilgrim here tonight is a Spaniard who has been walking for most of 2013 it seems. He has been to Santiago and is now walking this route backwards until he joins up with a route walking to Rome. From his créanciale he seems to collect stamps from every single stop he makes not just for the places at which he stays. I am in awe of his enthusiasm. Not saying mine is waning but four months or more of walking is not for the feint of heart, or feet. What a lovely stop. And yeah, four months of walking...truly a "feet"!